Not to be confused with iPad (2nd generation) or iPad Air 2. Top: New iPad Mini 2 Logo and Original iPad mini 2 Logo with the name "iPad Mini with Retina Display"
The iPad Mini 2 (stylized and marketed as the iPad mini 2, previously marketed as the iPad mini with Retina display) is the second generation iPad Mini tablet computer produced and marketed by Apple Inc. It has a design almost identical to that of the first generation iPad Mini but features internal revisions such as the addition of the A7 system-on-a-chip and 2,048 × 1,536 resolution Retina Display. The iPad Mini 2 has nearly the same hardware as its larger sibling, the iPad Air. Apple released the iPad Mini 2 in Space Gray and Silver colors on November 12, 2013. Its successor, the iPad Mini 3, was unveiled on October 16, 2014, featuring the same internals but adding Touch ID, differing storage sizes, and an additional gold color. The iPad Mini 2 was discontinued on March 21, 2017, following the press announcement of a new, lower cost iPad, which replaces the iPad Air 2. The iPad Mini 2 is the first iPad Mini to support six major versions of iOS, from iOS 7 through iOS 12. The iPad Mini 2 was announced during a keynote at the Yerba Buena Center for the Arts on October 22, 2013. The theme of the keynote was named 'We still have a lot to cover.' Originally, at the time of its release, the iPad Mini 2 was officially marketed as the "iPad Mini with Retina Display". However, when the iPad Mini 3 was announced on October 16, 2014, Apple started marketing the second generation iPad Mini as iPad Mini 2. The iPad Mini 2 comes with the iOS 7 operating system, released on September 18, 2013. Jony Ive, the designer of iOS 7's new elements, described the update as "bringing order to complexity", highlighting features such as refined typography, new icons, translucency, layering, physics, and gyroscope-driven parallaxing as some of the major changes to the design. The design of both iOS 7 and OS X Mavericks (version 10.9) noticeably depart from skeuomorphic elements such as green felt in Game Center, wood in Newsstand, and leather in Calendar, in favor of a flat, colourful design. It can act as a hotspot with some carriers, sharing its Internet connection over Wi-Fi, Bluetooth, or USB, and also access the Apple App Store, a digital application distribution platform for iOS. The service allows users to browse and download applications from the iTunes Store that were developed with Xcode and the iOS SDK and were published through Apple. From the App Store, GarageBand, iMovie, iPhoto, and the iWork apps (Pages, Keynote, and Numbers) are available. The iPad mini 2 has a bluetooth function that attaches a wireless keyboard or headset. This allows the user to access a wireless keyboard that can be used in Apple Pages or any writing program that needs editing. The iPad Mini 2 comes with several pre-installed applications, including Siri, Safari, Mail, Photos, Video, Music, iTunes, App Store, Maps, Notes, Calendar, Game Center, Photo Booth, and Contacts. Like all iOS devices, the iPad can sync content and other data with a Mac or PC using iTunes, although iOS 5 and later can be managed and backed up without a computer. Although the tablet is not designed to make phone calls over a cellular network, users can use a headset or the built-in speaker and microphone to place phone calls over Wi-Fi or cellular using a VoIP application, such as Skype. The device has a dictation application, using the same voice recognition technology as the iPhone 4S. This enables users to speak and the iPad types what they say on the screen, though the iPad must have an internet connection available (via Wi-Fi or cellular network) due to the feature's reliance on Apple servers to translate the speech. The iPad Mini 2 has an iBooks application (originally an optional app, though since the release of iOS 8, it comes pre-installed), which displays books and other ePub-format content downloaded from the iBooks Store. Several major book publishers including Penguin Books, HarperCollins, Simon & Schuster and Macmillan have committed to publishing books for the device. Despite being a direct competitor to both the Amazon Kindle and Barnes & Noble Nook, both Amazon.com and Barnes & Noble offer e-reader apps for the iPad. Siri, an intelligent personal assistant and knowledge navigator, is included. The application uses a natural language user interface to answer questions, make recommendations, and perform actions by delegating requests to a set of Web services. Apple claims that the software adapts to the user's individual preferences over time and personalizes results. iOS 7 adds new male and female voices, new system setting functionalities, a redesign to match the rest of the operating system, and integration with Twitter, Wikipedia, Bing, and Photos. Facebook comes integrated through Apple's native apps. Facebook features can be directly accessed from within native apps such as Calendar which can sync Facebook events, or use Facebook's like button from within the Apple App Store. On June 2, 2014, it was announced that the iPad Mini 2 would receive the iOS 8 update. On June 13, 2016, it was then announced that the iPad Mini 2 will support the iOS 10 update. On June 5, 2017, it was also announced that the iPad Mini 2 will support the iOS 11 update. Apple announced that the iPad Mini 2 will support the iOS 12 update together with its other Apple A7 cousins, this will make the first iPad mini to support six major versions of iOS (iOS 7 through iOS 12) and will be the longest supported iPad Mini. Size comparison between the iPad Mini and the second, third, and fourth generation full-sized iPad. 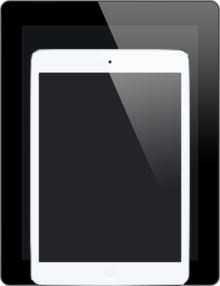 The iPad Mini 2 has the same sized 7.9-inch screen, and largely the same design as, the first generation iPad Mini (1st generation). One notable change is the inclusion of a Retina Display, matching the screen resolution of the full-sized Retina iPad models. As the Mini 2 features the same resolution as the iPad Air, this makes the Mini 2's screen even more pixel dense compared to its larger sibling. 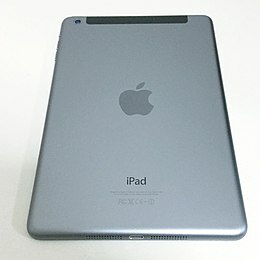 The slate-colored back panel of the first-generation iPad Mini was discontinued in favor of "Space Gray" (a lighter grey tone), whilst the Silver color option still remained. The iPad Mini 2 shares hardware components from the iPad Air and iPhone 5S, notably the 64-bit Apple A7 system-on-chip and Apple M7 motion processor. The Mini 2's A7 system-on-chip is clocked slightly slower but otherwise the same as the one in the iPad Air and iPhone 5S, all three which were released in Q4 of 2013. The Mini 2 uses the same home button as its predecessor and therefore does not support Touch ID, a feature added in the succeeding iPad Mini 3. The Mini 2 also includes a 5 megapixel rear-facing camera, a 1.2 MP FaceTime HD front-facing camera, support for 802.11n, and an estimated 10 hours of battery life. As with all previous generations of iPad hardware, there are four buttons and one switch on the iPad Mini 2. With the device in its portrait orientation, these are: a "home" button on the face of the device under the display that returns the user to the home screen, a wake/sleep button on the top edge of the device, and two buttons on the upper right side of the device performing volume up/down functions, under which is a switch whose function varies according to device settings, functioning either to switch the device into or out of silent mode or to lock/unlock the orientation of the screen. In addition, the WiFi only version weighs 331 grams while the cellular model weighs 341 grams – slightly more than their respective predecessors. The display responds to other sensors: an ambient light sensor to adjust screen brightness and a 3-axis accelerometer to sense orientation and switch between portrait and landscape modes. Unlike the iPhone and iPod Touch's built-in applications, which work in three orientations (portrait, landscape-left and landscape-right), the iPad's built-in applications support screen rotation in all four orientations, including upside-down. Consequently, the device has no intrinsic "native" orientation; only the relative position of the home button changes. The audio playback of the iPad Mini 2 is in stereo with two speakers located on either side of the lightning connector. The iPad Mini 2 was originally available with 16, 32, 64 or 128GB of internal flash memory, with no expansion option. However, as of the announcement of the iPad Mini 3 on October 16, 2014, the 64 and 128GB versions of the iPad Mini 2 were discontinued and, on September 7, 2016, the 16GB model was discontinued as well. The final model, 32GB, was discontinued on March 21, 2017, following the unveiling of the new, lower-cost iPad. Apple also sells a "camera connection kit" with an SD card reader, but it can only be used to transfer photos and videos. All iPad Mini 2 models can connect to a wireless LAN and offer dual band Wi-Fi support. It is also manufactured either with or without the capability to communicate over a cellular network. The tablet's cellular model comes in two variants, both of which support nano-SIMs, quad-band GSM, penta-band UMTS, and dual-band CDMA EV-DO Rev. A and B. Additionally, one variant also supports LTE bands 1, 2, 3, 4, 5, 7, 8, 13, 17, 18, 19, 20, 25 and 26 while the other variant supports LTE bands 1, 2, 3, 5, 7, 8, 18, 19, 20 and TD-LTE bands 38, 39 and 40. Apple's ability to handle many different bands in one device allowed it to offer, for the first time, a single iPad variant which supports all the cellular bands and technologies deployed by all the major North American wireless providers at the time of the device's introduction. The Mini 2 was praised for packing essentially same hardware as the larger and more expensive iPad Air, while being significantly more compact and lighter, featuring an even more pixel-dense screen (keeping the same resolution despite a smaller display), and being $100 USD cheaper than the Air. The Mini 2 essentially rendered obsolete the similarly-priced iPad 2 and iPad 4, which remained in Apple's iPad lineup during the first year of the Mini 2's availability as a budget alternative to the iPad Air. Writing for TechRadar, Gareth Beavis awarded the iPad Mini 2 a rating of 4.5 out of 5. Beavis praises the retina display and A7 chip performance, and states that its "design is still the best in the tablet category." However, he does criticize the price increase. On his website, AnandTech, Anand Lal Shimpi highly compliments the design and increased speed of the iPad Mini 2 while lamenting the limited color palette, stating "...it’s a shame that this is a tradeoff that exists between the two iPads especially given how good Apple is about sRGB coverage in nearly all of its other displays." Despite some criticisms, such as the quality of the camera, Jeffrey Van Camp of Digital Trends gave the tablet a score of 4.5 out of 5. He writes: "The iPad Mini 2 is our favorite tablet of 2013. With a powerful 64-bit A7 processor and a high-resolution ‘Retina’ screen, it finishes the job that Apple started with the first iPad Mini", addressing the main complaints about the original Mini's under-powered processor and low-resolution display. Like other contemporary iPads, the Mini 2's rear camera photo quality was mediocre compared to the iPhones. The iPad Mini 2 was also considerably more expensive than its closest Android competitor, the Nexus 7, although the Mini 2 was significantly more powerful and had better build quality as well as Apple's larger tablet-specific app selection and more established ecosystem. The iPad Mini 2 was criticized for being thicker and heavier than the original iPad Mini. It was also criticized for taking a longer time to charge. ^ Shimpi, Anand Lal (March 31, 2014). "Apple's Cyclone Microarchitecture Detailed". AnandTech. Retrieved October 18, 2014. ^ a b "iPad Mini Retina Display Teardown". iFixit. November 12, 2012. Retrieved March 4, 2014. ^ Shimpi, Anand Lal (September 17, 2013). "The iPhone 5s Review: GPU Architecture". AnandTech. Retrieved September 18, 2013. ^ "Apple decks out venue for iPad event next week". CNET. CBS Interactive. Retrieved October 24, 2013. ^ Souppouris, Aaron (September 10, 2013). "iOS 7 will come to iPhones and iPads on September 18th". The Verge. Vox Media. Retrieved October 22, 2013. ^ Cue, Eddy; Cook, Tim; Federighi, Craig; Ive, Jony et al. (June 10, 2013). WWDC 2013 Keynote. Moscone West, San Francisco, California: Apple Inc. Event occurs at c.1h 25min, to end. Retrieved October 22, 2013. ^ Ankan Deka, Jim (September 14, 2011). "iPad – the Musician's Genie". EF News International. Eastern Fare Music Foundation. Archived from the original on October 30, 2011. Retrieved October 22, 2013. ^ "The new iPad – Amazing iPad apps, built right in". Apple. March 7, 2012. Retrieved October 22, 2013. ^ Sarno, David (January 29, 2010). "Apple confirms 3G VoIP apps on iPad, iPhone, iPod touch; Skype is waiting". Los Angeles Times. Retrieved October 22, 2013. ^ "The new iPad: It's a Breakthrough because it features are". Apple. March 7, 2012. Retrieved October 22, 2013. ^ Patel, Nilay (January 27, 2010). "The Apple iPad: starting at $499". Engadget. AOL. Retrieved October 22, 2013. ^ Topolsky, Joshua (January 27, 2010). "Live from the Apple 'latest creation' event". Engadget. AOL. Retrieved October 22, 2013. ^ Electronista Staff (December 9, 2009). "Apple tablet due March, to get Kindle-killer book deal?". Electronista. MacNN. Retrieved October 22, 2013. ^ "Free Kindle Reading Apps". Amazon.com. Retrieved October 22, 2013. ^ "Free NOOK app for iPad, Download eReader app – Barnes & Noble". Barnes & Noble. April 20, 2012. Retrieved October 22, 2013. ^ "Apple – iOS 7 – Siri". Apple Inc. Retrieved October 22, 2013. ^ "iOS 7 Features". Apple Inc. June 13, 2013. Retrieved October 22, 2013. ^ Clark, Jason (August 28, 2013). "Platform Updates: Facebook SDK for iOS 7 and Promotions Updates". Facebook. Retrieved October 22, 2013. ^ Davies, Chris (September 18, 2013). "Facebook and Twitter get iOS 7 app refresh". SlashGear. R3 Media. Retrieved October 22, 2013. ^ "Which iPhone, iPad and iPod touch models will get iOS 8? Find out here". Tech Times. June 4, 2014. Retrieved June 4, 2014. ^ a b c d "iPad Mini– Technical Specifications". Apple. Retrieved October 25, 2013. ^ "Apple's got it wrapped up for Christmas!". The Daily Mail. October 23, 2013. Retrieved October 23, 2013. ^ Beavis, Gareth (December 9, 2013). "iPad mini 2 with Retina display review". TechRadar. Retrieved December 17, 2013. ^ Lal Shimpi, Anand (November 16, 2013). "Apple iPad mini with Retina Display: Reviewed". AnandTech. Retrieved December 30, 2013. ^ Van Camp, Jeffrey (November 15, 2013). "Apple iPad Mini 2 Review". Digital Trends. Retrieved December 17, 2013. ^ Sorrel, Charlie (February 18, 2014). "The Retina Mini Is So Disappointing I Switched To The iPad Air [Opinion]". Wikimedia Commons has media related to iPad Mini.